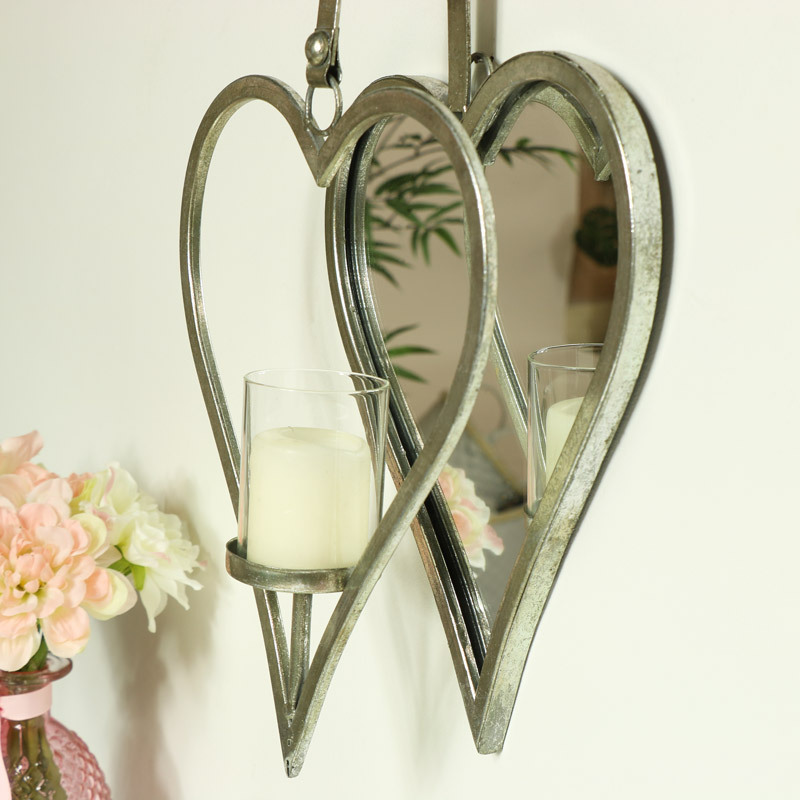 Charming antiqued silver heart shaped wall mirror with candle sconce. Beautifully decorative with shabby chic elegance. Use singly or in pairs for an elegant look in the living room or hallway. Such a pretty way to add a little candlelit glow to your home decor. The mirror features a heart shaped frame with the candle holder. The sconce will easily hold a large tealight or pillar candle with glass cup included. We have a great selection of candle sconces, holders and candlesticks to choose from. 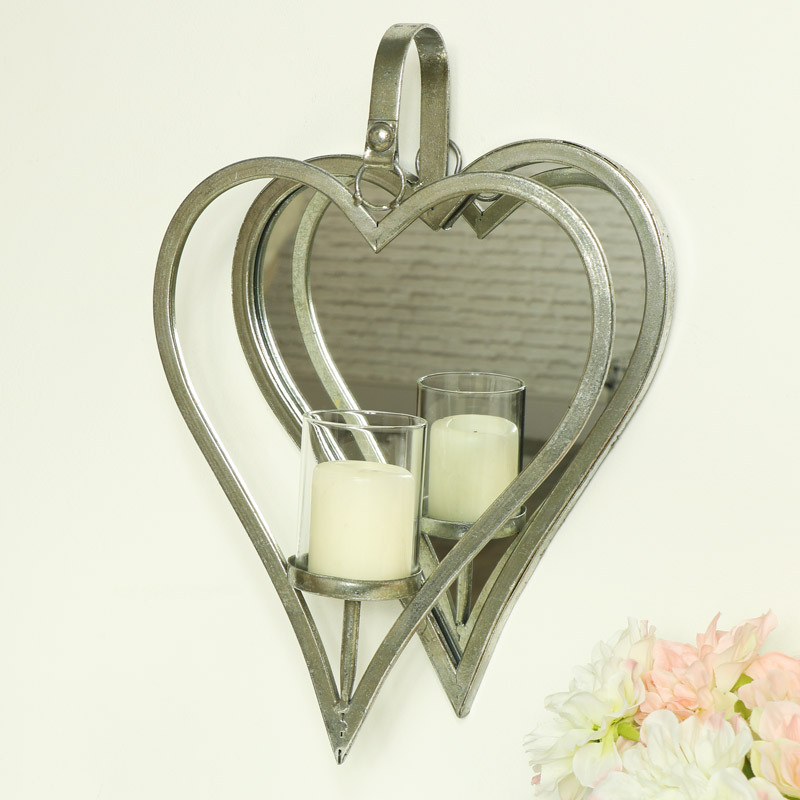 Charming antiqued silver heart shaped wall mirror with candle sconce. Beautifully decorative with shabby chic elegance. Use singly or in pairs for an elegant look in the living room or hallway. Such a pretty way to add a little candlelit glow to your home decor. The mirror features a heart shaped frame with the candle holder. The sconce will easily hold a large tealight or pillar candle with glass cup included. We have a great selection of candle sconces, holders and candlesticks to choose from. Constructed with a metal framed mirror & hanging heart decoration with candle holder. Finished in an antiqued silver and easily wall mounted with an eyelet on the back.